Last year I sat on one of those rare end-of-the-year interdisciplinary and cross-school BA thesis defenses wherein something actually happened. That the student was making statements I could not completely follow was typical enough: there is usually a fog of complacent confusion when faculty come together from different divisions of the university to sit on the assembly line of BA theses. The unspoken understanding is that everyone will pass. One goes through the motions. There are more important matters to attend to. This is undergraduate stuff, after all. We owe it to them. Out of a curiosity I could not suppress, or perhaps sheer caprice –the other faculty were ready to wrap it up– I pushed to understand the underlying assumptions of the student’s argument. She had been a student of mine during her freshman and sophomore years of core Liberal Studies and I remembered her as an honest, even if offbeat, thinker. She was still game, cared about her work, and welcomed the opportunity to engage and respond. After a quick series of back and forths we arrived at her underlying and unspoken general theoretical principle: “Debt is a good thing.” She had built her thesis around the assumption that debt, student debt specifically, is desirable, without having addressed it directly. She took it as a given, and thought we would as well. We left the thesis defense at that, and she deservedly passed. She accepted my invitation to coffee after I decided to be late for a friend’s concert at the German consulate in order to continue the conversation. Could she say more about how debt is a good thing? That Francis (the student) was making this statement without any value or moral judgment was provocative, and disorienting. Her remarks vaguely brought Nietzsche to mind, and I knew she had encountered the Genealogy of Morals in her first two years of Core training. For Nietzsche the origin of Christian and modern morality is in the creditor-debtor commercial relationship. The Debtor is guilty. He owes. Guilt simply means debt. And while debt does not condemn you to an eternal afterlife in hell, it does work to control, regulate, and make you feel obligated and enslaved in this lifetime. That is the purpose of debt, to make you feel guilty and thus control and discipline you. At the moment we are born, if we are born into a community, we are “guilty” because we already owe our existence and survival to the family, community, society. A life project, is the project of redemption of this debt. That is how we remain part of the social. Nietzsche, of course, does not celebrate this state of affairs. How this condition had come to be “desired” by Francis’s cohorts was puzzling. I became convinced –too soon and rather hastily– that this generation has bought wholesale the ideology of debt as duty to the community, as social duty, and as the only way to belong to the social or political order. Without debt, you are as good as undocumented; you do not count, you are out of social circulation. With debt, you have a future, a purpose, a project – of working towards solvency. No matter that just as the Christian original sin, modern debt –student or sovereign– has become too big to be paid by the debtor. Just as in the Christian model, only the creditor (God himself) is capable of paying or bailing the debt — a formula which Nietzsche ridicules by suggesting ironically that the creditor could have simply forgiven the debt. Why did he have to pay himself by punishing himself? Yet, in Francis’ statement that debt can be an instrument for the good, there was something more: an excess, a genuine proto-political and liberatory statement which became fully evident to me only after the events of last year, and was epitomized in the provocative image of Greek finance minister Yanis Varoufakis in the colorful patchwork shirt after he was accused of treason. From the outset, Varoufakis understood that Greek debt could not be paid, and the creditors did not want it to be fully paid, but that by moralizing the debt –“the moral hazards”– they were using it as an instrument of power and control. That is why Varoufakis’ aesthetics was ridiculed from the very start, the media scandalized by his leather jacket, his inappropriate style. Before Varoufakis’ ideas, it was his style that was targeted, demonized, and attacked with a vehemence that was extraordinary. He never disputed the debt; he rejected the moralizing part. Varoufakis’ style was political strategy because it rejected the debtor’s shamed body, where debt is guilt, and guilt is internalized and then turned into an instrument of social control. In the same vein, last year we saw the first student debt strikes, and the Rolling Jubilee Project which is a debt solidarity group, using debt default as a political tool. In Walter Benjamin’s formulation, the institution’s technique is a “fascist” formula of aesthetization and moralization of politics . 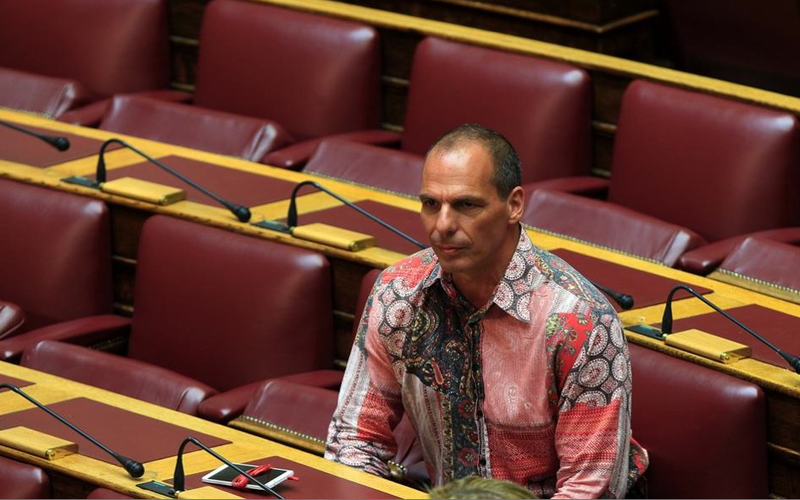 On the other hand, Varoufakis politicized fashion and debt. *It was also on the aesthetic ground that V. lost legitimacy. The Paris Match photo shoot killed Varoufakis. The “autonomous” look became abject with distasteful and cringe-inducing images which were the epitome of bourgeois bad taste. Varoufakis never recovered from that. N. says that a creditor gets the right to physically punish, to be violent and cruel towards the debtor who can not pay back the “money”. The creditor will not get back his money, but he will get the right to be cruel and exert punishment. Under what circumstances would this “equivalence” work? Only if the right to humiliate, to have contempt, or be cruel was a VALUE IN AND OF ITSELF. I don’t get my money? Then I will have the pleasure of releasing my power, power on you. eloquent offering. powerful and insightful. Thank you!